This is a place where I have collected materials about my system for learning languages called the Gold List method. I have started work on a book, which should be a useful addition to this, and in the near future, following on from my appearance speaking about this on “Dzien Dobry TVN” on 1st November 2009, I shall do a Polish film about the Gold List method, to help the large number of people who contacted me about it following the show. I don’t really like the term “final thoughts” as it sounds as if I am planning to stop thinking afterwards, or maybe stop existing altogether, which I am certainly not considering if I can help it, however I do need, as Victor Berrjod kindly reminds me, to round this off, hence the title. Let me just get a coffee, this could be a longish article, maybe you would like one as well? Just about anything you can do in a language bases on one or more of these four functions. Take a moment if you like to see of you can think of any activity involving language that is an exception, and by all means tell me in the comments. Personally I could not think of any exceptions. We’ve also considered that for one pair of these functions, listening and reading, the learner is on the receiving end of polished language and therefore is able to use his or her passive knowledge to engage in the function and its related activities. 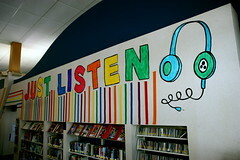 Listening is more challenging than reading because the user has less ability to control the speed, although there are instruments available based on developing listening skills where you can control the pace of listening. We talked about audio courses where you have your pause button, and another good one is Audible where you can buy audiobooks in other languages and set a slower narrator speed, or a higher one in order to develop ‘listening fluency’. 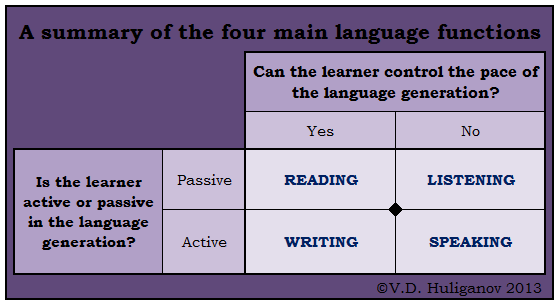 However, in the main, for the passive pair as long as a word is known passively the learner will not be put off his or her stride by reading or hearing it as they will be able to recall its meaning when it is given in the language much easier than when he or she needs to generate the expression and knows it passively, but is not in an active state, and the mind goes blank. Personally I think flashcards are a reasonable system but they’re not an ideal system. In fact you can get there with less time involved by using the Goldlist method. Flashcards still involve repetition of things you really already know, which is not efficient. Also you can only learn what is in the pack, whereas with Goldlist you learn any material you like the look of. In addition learning off the phone while travelling depletes your battery and you cannot do it in a sunny park as you cannot see the screen. Having a small writing book is a better way and turns out more ergonomic than trying to do every single part of life through computer screens and telephones. Flashcard systems like Anki and Supermemo are built on the work of Ebbinghaus, the father of the area of psychology that looks at memory, in fact they reflect Ebbinghaus’findings even more closely than my system, which is only an approximation, but they still don’t eliminate waste. The downside of the Goldlist is that there are mandatory waiting periods of two weeks at least between each distillation, so if someone is in a hurry because they have a trip or an exam coming up, then there may not be enough span of time to use Goldlist, even though Goldlist would give them more long-term memorisation per unit of time spent.